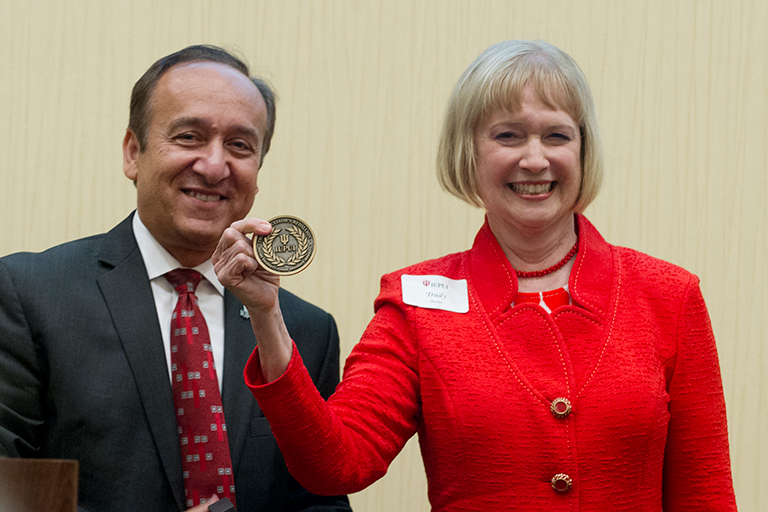 Trudy Banta was awarded the IUPUI Chancellor's Medallion by Chancellor Nasser H. Paydar at her retirement celebration on June 23, 2016. Since joining IUPUI in 1992, Dr. Banta has made a significant impact on the principles of undergraduate learning, accreditation, and program review. Dr. Banta established the IUPUI Office of Planning and Institutional Improvement in 1992. Through her position as the vice chancellor, the office hosted the Assessment Institute in Indianapolis, the nation's oldest and largest event focused on outcomes assessment in higher education. In 2006, she became the senior advisor to the chancellor for academic planning and evaluation. As a professor of higher education for the School of Education, Dr. Banta has presented at conferences in 25 countries and has developed and coordinated 30 national and 15 international conferences. She received ten national awards for her work, served on advisory panels, and consulted with faculty in 47 states. Not only has she written or edited 20 books and several hundred articles and reports on assessment, but she is also the founding editor of the award-winning Assessment Update, a bi-monthly periodical published since 1989.